When it comes to Africa both during and after colonialism, many states can be recognized as having some of the worst leaders the world has ever seen. African dictators can be some of the richest people in the world and leading a country filled with the poorest. They can kill and starve their people with impunity while lining their own pockets. They treat the land and lives of millions as their own personal playgrounds, making people work to increase the fortune of their leaders while they face brutal reprisals if they don’t work. Many of these dictators are in power due to military coups and some continued to stay in power due to the proxy wars of the cold war. Even as the outright corruption was obvious, inflation skyrocketed and humanitarian groups were unable to function, these leaders were able to stay in power due to brutal enforcement of their regime. 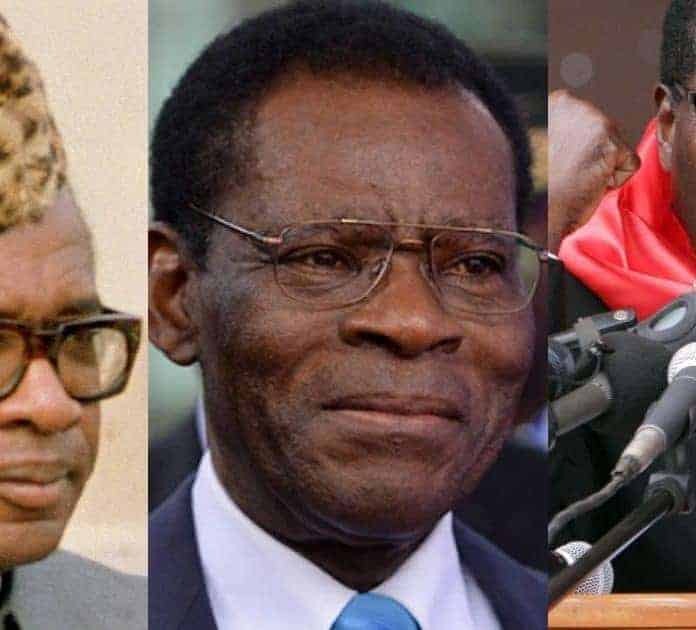 Unfortunately, this list is far from comprehensive as there are many other African leaders that can be considered just as bad or worse, depending on your criteria. Franciso Macias Nguema was the very first president of Equatorial Guinea and he created a bad example for those that would follow him. In 1964 he became deputy prime minister and he became president when he won the only free election the country has ever had in 1968. In 1971, Macias Nguema put forth a decrees that bestowed all powers of the government and its institutions to him. On October 18th, 1971 he declared that anyone who threatened the president or the government would be punished with death. Insulting the president or his cabinet was punished with 30 years in prison. During his reign nearly a third of the population was killed or exiled. Franciso Macias Nguema was a very paranoid man and one who would relinquish power to no one. He stayed in a hut in his ancestral village and kept all of the national treasury under his bed or in suitcases in his hut. He was also distrusting of anyone who was educated or appeared to be educated (wearing spectacles for example). So he killed or exiled anyone who appeared to be educated and it became very dangerous for anyone to have any books or written papers in their possession. Francisco Macias Nguema hoarded the money of the state, never taking it out of his suitcases. Government officials and the national guard often went great lengths without seeing any form of payment but they dared not ask for it. In 1979 members of the National Guard, including Macias Nguema’s own brother requested that they be allowed to take money from the suitcases to pay the National Guard. They were all immediately executed. It was this paranoia that eventually led to the end of Macias Nguema’s reign. His own nephew, Teodoro Obiang Nguema Mbasogo, who was also a member of the National Guard, believed that it was kill or be killed and decided to overthrow his uncle in 1979.